Children at Highwood Nursery in Brockenhurst have been learning more about the importance of road and forest safety thanks to a £4,045 grant from the National Lottery’s Big Lottery Fund. 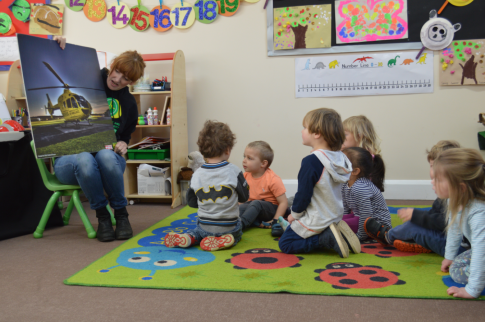 The nursery, which is at Brockenhurst College, invested the money in road safety play equipment, dressing-up clothes for role play, child-size hi-vis vests and a series of visiting speakers. As part of the programme, the Hampshire and Isle of Wight Army Cadet Force teamed-up with Brock Public Services students to perform role play activities for the children. This involved dressing as police officers and using road signs to help youngsters learn about road safety in a practical and engaging way. Senior Road Safety Officer for Hampshire County Council, Julia Shopland, also ran a session on road safety and talked about the importance of being visible to traffic. In addition, Lindsey Stride from the Shared Forest project taught the young learners how to behave around forest animals and about understanding the difference between wild animals and pets. Finally, Hampshire and Isle of Wight Air Ambulance staff visited to teach the children about why, when and how to dial 999. Childcare Manager Vicky Bidwell commented: “The children have learned so much and have even been reporting their new knowledge to their families at home, which is fantastic. “Receiving the lottery grant has been hugely beneficial because we’ve been able to acquire the resources needed to elevate our teaching in this extremely important area,” she added. Highwood Nursery looks after children aged between three months and five years. It is currently rated by Ofsted as ‘Outstanding’.